On the inside of every Henry Herbert jacket, you will always find a label, discreetly hidden inside the inner pocket, stating the date we made the suit and who it was made for. This is a tradition of Savile Row, one of many personal and subtle finishes of a bespoke suit by Henry Herbert Tailors. See also: Bespoke Shirts, bespoke suit, Bespoke Suits, Henry Herbert, Henry Herbert Tailors, inner pocket, Jacket, label, Savile Row, savile row tailor, suit, Tailored Suits, tailors, tradition, wedding suits. 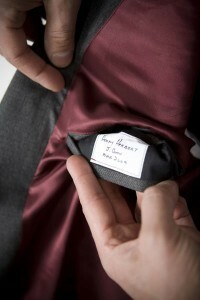 Henry Herbert Tailors - Inside a Henry Herbert Jacket. Inside pocket labelling - a tradition of Savile Row, one of many personal and subtle finishes of a bespoke suit by Henry Herbert Tailors.